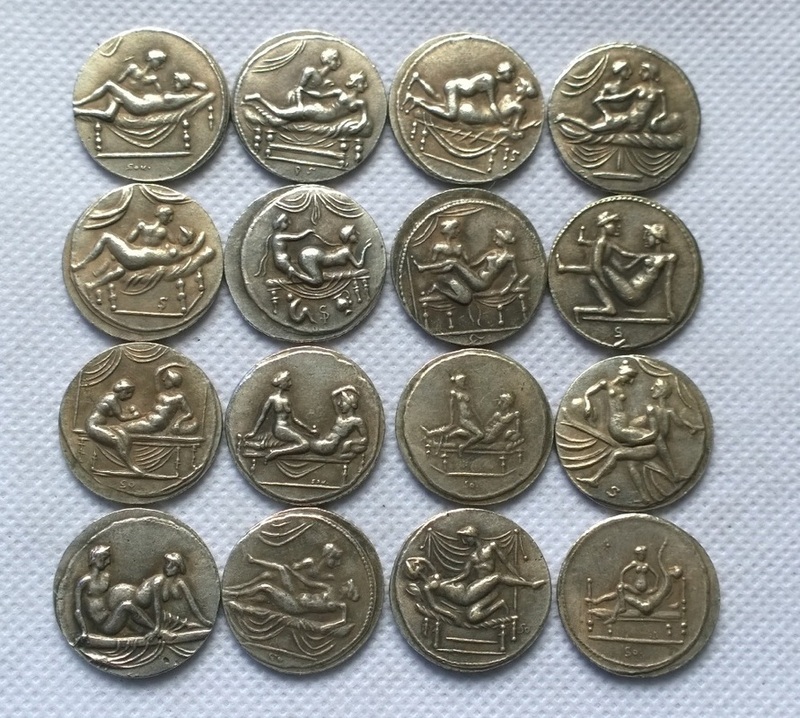 The club has an interesting variety of replica Roman coins that includes the Twelve Caesars, Antony & Cleopatra, Ferrata VI Legion, many republicans and emperors, and also curious oddities such as the numbered brothel-tokens. Online details of most Roman coins are available at wildwinds coins and at Coins of the Roman Empire. The Temple of Juno Moneta was built on the Arx in 344 BC to honor Juno and her sacred geese for warning Rome of the invasion of the Gauls in 390 BC. Moneta referred to Juno's warning, and as the Temple also became the Roman Mint, became the origin of our word for money. 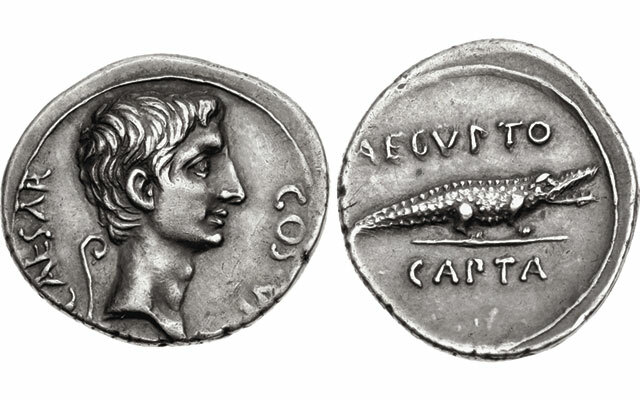 Die engraving and cold hammer striking techniques for the minting of coins remained basically the same for most of antiquity. ​Throughout the imperial mintages, the lettering style remains quite uniform and some variation shows a change of artists, rather than distinct mints. The Roman Mint was only at the Temple of Juno. There were about 40 provincial mints in the Eastern Provinces, which mostly produced bronze city-coinage. The Provincial mints included Antioch, Epheseus, Sardis, Smyrna, Tyre, Ashkalon, Caesaria Maritima, Bostra, and Caesaria of Cappadocia. 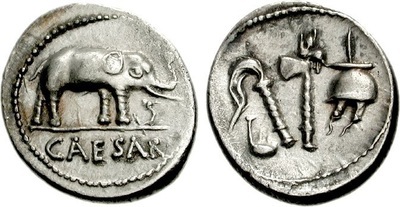 Official silver currencies issued to supplement the Roman denarii could by weight be tarriffed both by Greek and Roman standards. 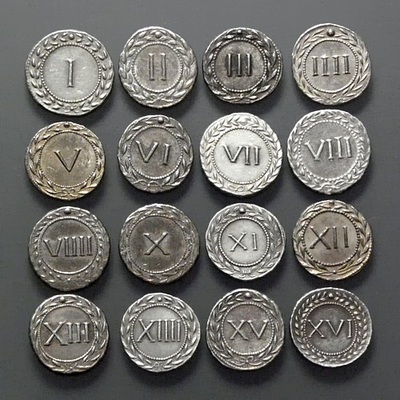 The Greek monetary standards were based on the silver drachma, and in the Levant the Phoenician standard was used. 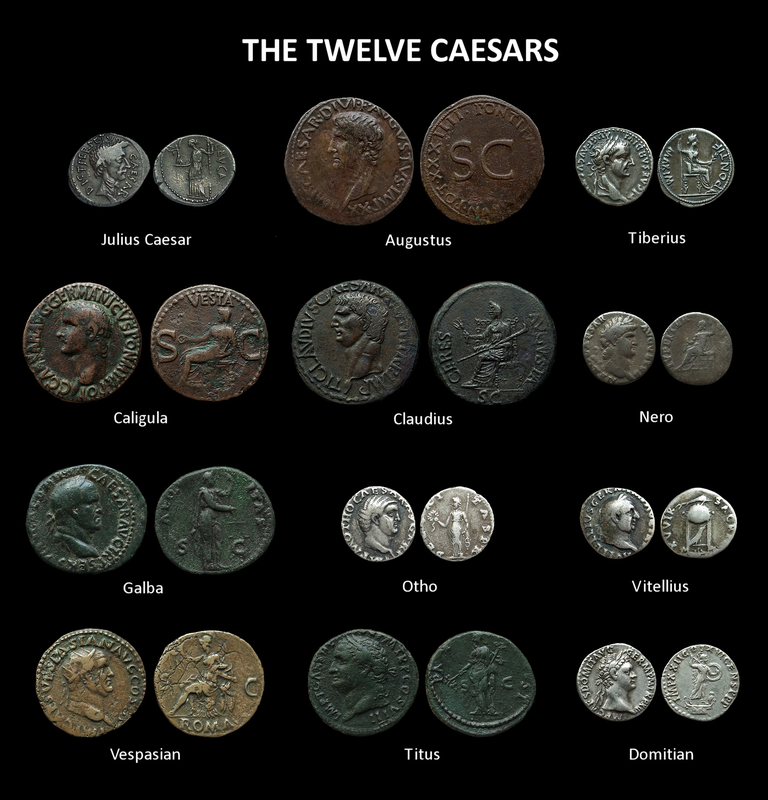 ​The base metal coins were the 'aes' and the 'sesterti', which were usually copper alloys. Brass and copper coins were comonly called 'senatorial' because of the 'S.C.' Senatus Consultum, appeared on them. But the control of coinage did not belong to the Senate or the Board of Three who presided at the mint in Rome. The Emperor controlled the coinage. 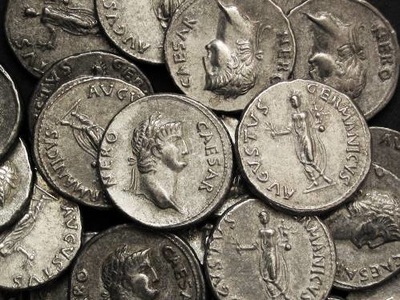 Silver coins were the'denarii' and the gold coins were the 'aureus'. Pictorial representations on Roman coins were direct, self-evident and good propaganda as the most important early media to indicate symbolic meaning. 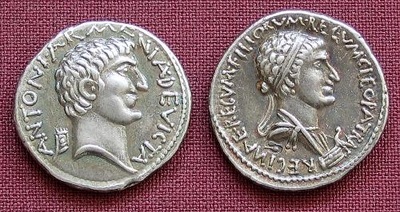 The political imagery of Roman Imperial coins clearly stated emperor's aims under the Pax Romana. 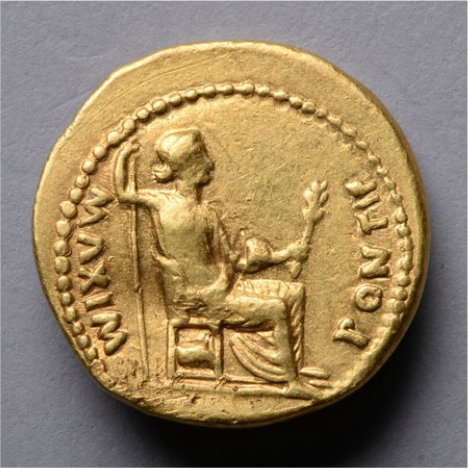 Early Imperial coins usually confined inscriptions to the reverses only, even when the obverse showed the Emperor. 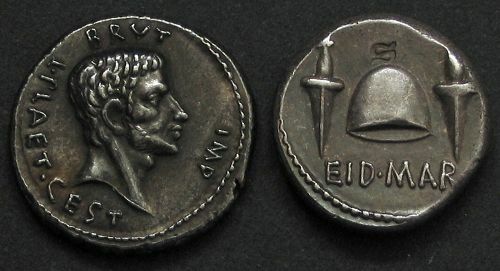 From the time of Nero, legends on the obverse give the names and titles of the Emperor. The legend begins with 'IMP' -Imperator, followed by an abbreviation of Caesar, then the name, which is usually in the nominative case, and finally 'AUG' -Augustus. Only on some coins of Hadrian and some of Trajan does the legend name appear in the dative case. ​Seen frquently is 'COS' -Consul, which many emperors took to maintain the appearance of having been elected. ​Other commonly seen titles are: 'PP' Pater Patriae- Father of his Country, 'PM' - Pontifex Maximus, 'FIL' -Filius, Son of.., 'PIUS PF ' - PIUS FELIX, Dutiful, 'CENS' - Censor. ​The names of the emperors from Augustus were often connected with personifications of the Virtues. These included: Aequitas, Aeternitas, Annona (the Harvest), Bonus Adventus, Clementia, Concordia, Constatiae, Fortuna, Libertas, Pax, Pietas, Salus, Securitas, Victoria, and Virtuti. From the second century other virtues appeared. 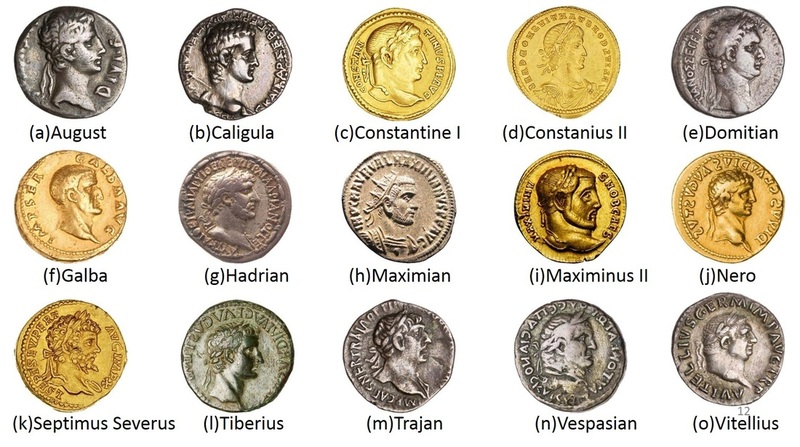 These included: Felicitas, Hilaritas, Justitia, Providentia, and only on the coins of Hadrian was also the virtue Patientia included. The 'PATIENTIA AUGUSTI' coin refers to Hadrian during his last illness. 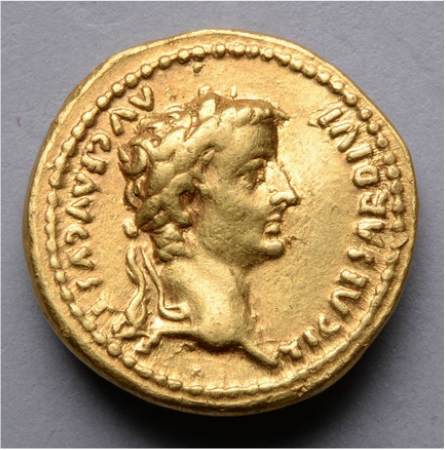 The 'HILARITAS' coin refers to public entertainments given by Hadrian on his birthday in 119 AD. 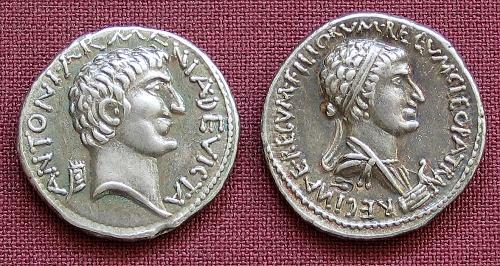 Political Imagery on Roman coins had great propaganda value. Vespasian used them effectively when he issued his 'JUDEA CAPTA' series. ​​Vespasian also issued an 'AEGYPTUS CAPTA' to celebrate the centenary of the battle of Actium. Domitian issued a 'GERMANIA CAPTA' in 84 AD. He issued a Denarius and Aureus, and a Sesterius in 85 AD for the conquest of the Black Forest region. Obv: IMP CAES DOMIT AVG GERM COS XI CENS PER PP legend with laureate head right. ​Rev: GERMANIA CAPTA legend around, SC in ex, trophy of arms, with a German captive, standing right with hands bound, and Germania sitting left on shields in an attitude of mourning. Roman Imperial coinage clearly represented the aims, achievements, and political aspirations of the Roman Empire and its Emperors. ​From: Lisa Clark, "Political Imagery on Roman Period Coins", Harvard University, 1990. "Tiberius Caesar, Son of the Divine Augustus, Augustus!" PONTIF MAXIM - "Chief Priest"
In 14 AD Tiberius became the second emperor of the Roman Empire. He was a more than able military leader, conquering areas of Pannonia, Dalmatia, Raetia, and temporarily Germania, thereby laying the foundations for the Empire's northern frontier. Despite this his reclusive and cruel nature, together with the rumours of his sexual perversions, made him largely unpopular. He died at the grand age of 77 on his remote Island retreat, Capri after ruling for 23 years. The coinage of Tiberius is highly coveted amongst collectors. He ruled during Jesus' lifetime and his silver denarius or 'Tribute Penny' is thought to be the very type offered to Christ for inspection in Mathew 22:21. This wonderful gold coin shares the same design but struck in gold, a far more valuable coin in antiquity and today worth around US$6000.